Turkey lies between the Black and Mediterranean seas, occupying the Asia Minor peninsula and the eastern edge of southern Europe. The country, whose official name is the Republic of Turkey, is slightly larger than Texas. Its capital, Ankara, is located in the northcentral region. Its climate is temperate with hot, dry summers and mild, wet winters; in the interior, the weather is more extreme. Turkey's location affords it dominion over one of the world's significant waterways. The European and Asian parts of Turkey are segmented by a narrow channel, called the Straits, which is the outlet of the Black Sea into the Mediterranean Sea. The channel is made up of the Bosphorus, the Sea of Marmara, and the Dardanelles. Turkey has a 4,474-mile coastline, a high central plateau (Anatolia), a narrow coastal plain and several mountain ranges. At 16,949 feet, Mount Ararat is the highest peak. Devastating earthquakes occur, particularly in the north, extending from Lake Van to the Sea of Marmara. The Republic of Turkey reflects Arabic, Byzantine, Greek, Roman and Turkish cultural influences, and is graced with diverse points of interest, such as the ruins of Troy in the west, and the amazing northwestern city of Istanbul, home to such attractions as the Blue Mosque and the Hippodrome. Turkey's economy is a mix of modern commerce and industry. It has a traditional agricultural base, which in 2001 comprised 40 percent of the country's workers. In 1923, the present-day republic of Turkey was fashioned out of the Turkish remainder of the Ottoman Empire. Shortly after its birth, the fledgling state instituted secular laws in place of traditional religious decrees. Turkey became a member of the UN in 1945, and in 1952 it joined NATO. A 2004 population estimate suggests there are nearly 69,000,000 people living in Turkey. Their ethnic breakdown is 80 percent Turkish and 20 percent Kurdish. The country is overwhelmingly Muslim, with less than one percent being Christian and Jewish citizens. 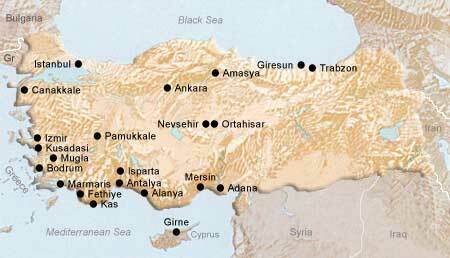 Several tongues are spoken in Turkey, including Turkish (the official language), Kurdish, Arabic, Armenian and Greek.